Skin Engine Technology and Features. Hue/saturation feature allows you tune any skin to fit your corporate or simply prefered colors. Windows common dialogs support: File Open, File Save, …. UserData, integrate any type of data into the skin. Customizable Animation of Push Buttons — Just One Line of Code! 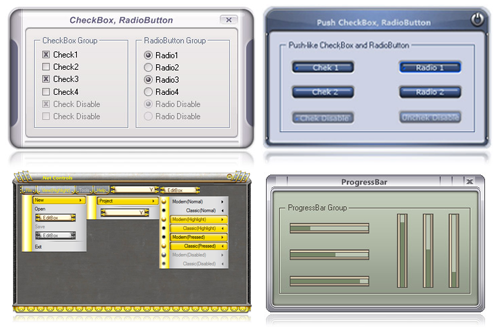 Most of the development environments do have stadard Windows interface, with common grey button and other solid and boring elements. With SkinCrafter you may easily apply custom drawn skin to your application with just a few lines of code. There are a lot of ready-to-use skins in Skin Galley, which might be integrated with your application. SkinCrafter is a leading skin technology provider and we are ready to start working for your projects. With us, user interface of your software will be attractive. You don’t need to change the way your user interface(UI) is created in your development invironment, SkinCrafter will take care of it since the very moment it’s integrated in your project. SkinBuilder is an application where SkinCrafter skins are built. It is absolutelly freeware. This means that any designer can create skins for you with no investment in development tool. You can do skins yourself! Check our detailed SkinBuilder manual to discover skins designing tips and techniques. Our customers can use and even modify any of the skins available in our gallery. Moreover, SkinBuilder supports import from .msstyles skins, which are available for free in thousands on the web. Software consists of a great number of elements. Most of them are common but some are rarely used. 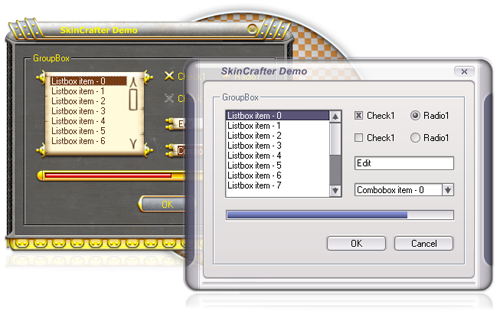 SkinCrafter supports skinning of most of standard controls available to developers. In case you didn’t find any needed component of your user interface in the list, SkinCrafter offers UserData feature to handle other controls. 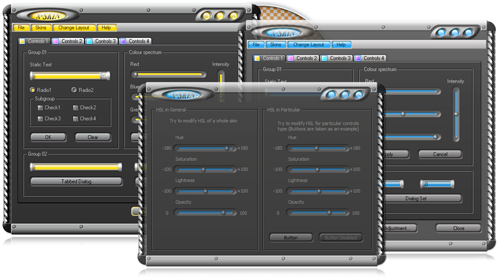 SkinCrafter technolgy allows to use several skins in a single application. Whether you need to make one part of the application look different, or just have several families of buttons, SkinCrafter team had already thought about such situations and we are offering working technologies to achieve the best results. When creating non rectangular windows, the known problem is jugged windows frame’s edges. This happens because of the sharp and pixelized border between you windows and background. Especially, it’s noticable when having dark window frame over light background, and vica-verca. SkinCrafter offers a unique solution. Our technology allows to create semitransparent windows frames, which look perfectly inspite of background tone. SkinCrafter skins do support alpha channel of the source images. You may insert PNG with alpha channel as a skin for any control. What are the advantages of alpha-channeled images in skins? 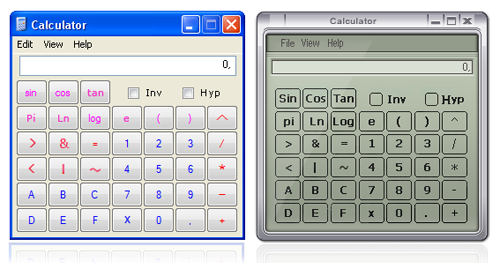 Well, as you know, all controls in Windows OS do have rectungular shape — all of them do! Not that long ago skins of rounded or any other non-rectangular shapes were implemented still with rectangular images, filling whole «empty» area with the color of background. That’s how old version of SkinCrafter worked. That was pretty difficult and brought some limitations. For example we could not create skins with gradient backgrounds. But, fortunely those times had passed, and now we can use alpha channeled images — which look very nice in all the cases. Localization always was a great deal for software vendors. You must know that Arabic and some other languages require different controls location and functionality. Therefore you should be sure your skinning engine will work well with those languages. Which means your skinned software will function properly too. SkinCrafter is proud to announce that we are the first skinning engine, which soppurt RTL layout completely. With a full RTL support you may switch layouts at runtime and skins will still function very nice. 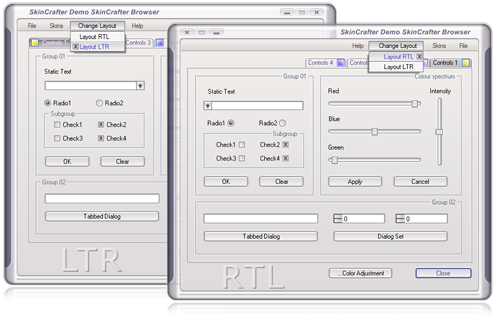 Only SkinCrafter engine allows your skins to look accurate in both RTL and LTR modes. There is a great number of skins available in our gallery and in free .msstyles skins archives. However, it’s not that easy to find a skin which will suit your case in full. Shapes and graphics is not that all. Very often you need to adjust an appearence of your software to be tuned with corporate colors and themes. That’s where Hue\Saturation\Lightness feature set is a very nice and handy tool. You may change the hues of each element in the skin without and editors or anything, this feature is built in our free SkinBuilder. It’s possible to change the hue of just window frame, or just buttons and textfields, or a whole skin theme to whatever you need. 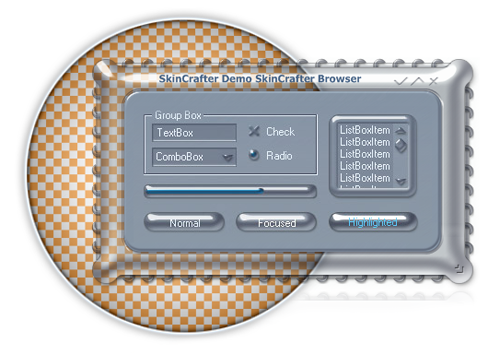 Your application will have the more full-fledged view when standard Windows common dialogs will be skinned with SkinCrafter technology. Skinned Windows common dialogs will prettify your application providing it with professional look. You can enhance your skin by adding a video clip, text, images, animation and sound effects (any files with binary data types). Inserting user data can add interest and excitement to your presentation, and help you emphasize the audience. Your interface with animated elements looks more attractive and spectacular than the usual non-animated GUI. You can apply alpha animation to some window control or to all the window elements of a certain type (read more information in Help/Methods/SetAlphaAnimation Method). Using Alpha Animation allows you to realize smooth transition from the ‘Normal’ state to the ‘Hot’ state. The smaller step, the smoother animation. Animation of the first three push buttons includes 15 frames with time span between frames 10 milliseconds. The other buttons animation consists of 50 frames with the same time span - 10 milliseconds. You're able to programmatically apply the number of frames and time span between frames. In other words, it's up to you whether to animate push buttons or not and you can customize the number of frames and set animation speed. Only push buttons animation is supported so far. Animation for radio buttons, check boxes, etc. is supposed to be added in the next releases.